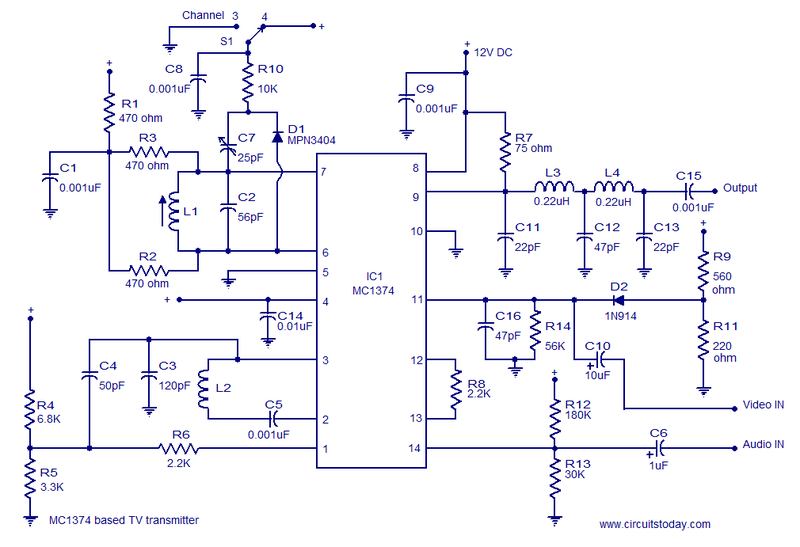 A very simple and high quality TV transmitter circuit based on IC MC374 is shown in this article.MC1374 is an integrated TV modulator circuit that can be used in various TV transmitter applications. The MC1374 includes all necessary circuitries required for a TV modulator such as sound carrier oscillator, FM audio modulator, dual input RF modulator etc. The IC packed with a lot of great features like wide dynamic range, single supply operation, low distortion, variable gain radio frequency modulator section, minimum intermodulation distortion, + or â€“ Sync etc. The IC requires few external components and can be operated from a supply voltage range from 5 to 12V DC.The circuit diagram of the TV transmitter using MC1374 is shown below. The video signal input to the circuit can be either negative or positive. The RF output will be approximately zero when the voltages at pin 1 and 11 are equal and the RF output increases linearly as the difference in voltage increases. Resistors R1,R2 and R3 determines the Q factor of the circuit are here their values are so chosen that the Q factor is around 15 which is the desired value for this IC. Resistor R8 connected between pins 12 and 13 sets the modulator gain. The RF output is available from pin 9 which is actually a source which drives a load connected from positive supply line to pin 9. The frequency of the RF oscillator is controlled by the tank circuit comprising of components L1 and C2 connected in association with pins 7 and 6. With the present values of L1 and C2 the RF oscillator frequency is around 105MHz. Components L3, L4, C11, C12 and C13 forms a double pi low pass filter which filters away second harmonics from the radio frequency output. These second harmonics usually occur at very high frequencies due to small imbalances in the device. Resistors R9 and R11 forms the bias circuit for the video input pin. Switch S1 can be used for selecting channel 3 or channel 4 operations. Frequency modulation is used for transmitting the audio signals. Inductor L2 connected between pin 2 & 3 and the capacitor C3 from pin 3 to ground forms the necessary tank circuit for the FM sections oscillator. Resistor R12 and R13 forms a biasing network for the audio input pin (pin14). C6 is the decoupling capacitor for the audio input while C10 is the decoupling capacitor for the video input. The modulate FM signal available at pin 3 of the IC is coupled pin 1 of the IC through resistor R6 and capacitor C4 and then this signal is modulated onto the AM carrier. Capacitor C9 filters off noise if any from the power supply. R4 and R5 form a biasing network for the pin 1 of the IC. C14 a noise bypass capacitor for the oscillator B+ pin (pin14) of the IC. This pin can be used for shutting down the sound system during the alignment of the AM section. Use a holder for mounting the IC. Circuit can be powered from anything between 5 to 12V DC. Using a battery for powering the circuit will reduce noise and improve the performance. If a DC power supply is used, then it must be well regulated. For L1 make 4 turns of #22Â enamelledÂ copper wire on a 0.25 inch plastic former. For L2 make 40 turns of #36 enamelled copper wire on a 0.18 inch plastic former. No display from the tv. Only blinking red indicated. Pls help me. please send PCB OF THIS CIRCUIT…. reply to nelson: that was a typo error. i have corrected it. could you check the values of R9 &R11 on the circuit (MC1347 TV Transmitter and make the necessary changes ?